I think this article is written by the same writer which I rebutted last few months on Airasia. Some of the writings are very true, some are to attract readerships. Generally, the landscape has been changing and people are taking planes being part of their occasional travel rather than it is a luxury. For the budget airlines, I am not that worried on the Middle Eastern airlines (like Emirates, Qatar, Etihad etc) in the long term. What I am more worried of are the Chinese airlines. The Chinese have the tendencies to throw prices with no fear over losses as the government tend to provide subsidies over areas that they want to support. 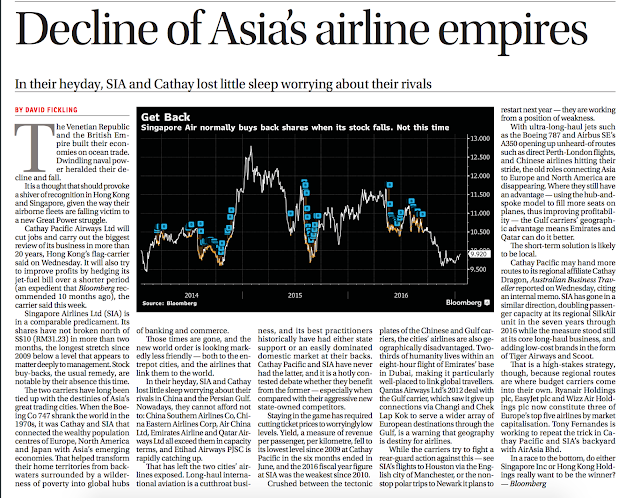 So far, I have yet to see Chinese government putting extra support over this but if it does, the other budget airlines - Airasia included should be wary. This is what the Trump's government has been against - subsidies and China likes to do subsidies in areas which they are fighting hard for. What's wrong with the perception on Airasia?